Here is a closer view with part of the Lower Jurassic Sutton Stone broken away to show fresh material. (We didn’t do this, despite the guilty-looking hammer. The hammer is Paul Taylor’s, by the way. Thanks, Paul!) 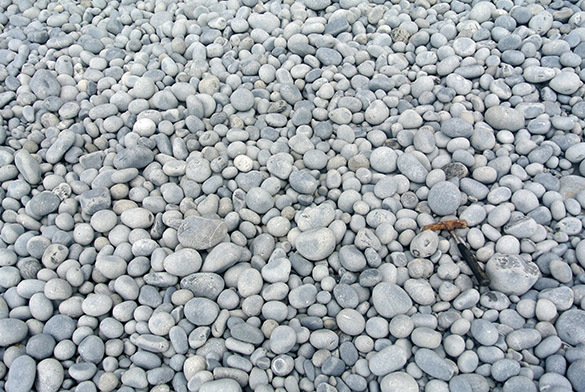 Note the pebbles in the Sutton Stone. 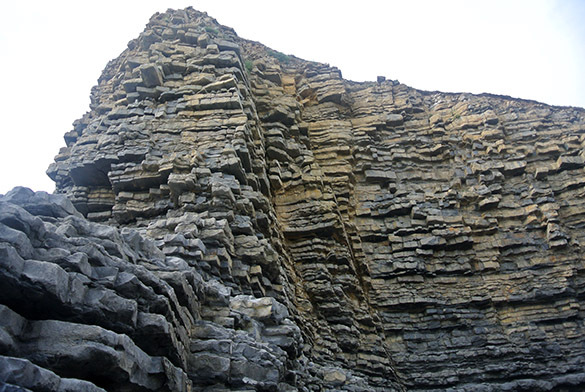 They are made of the Carboniferous limestone beneath. Classic unconformity. 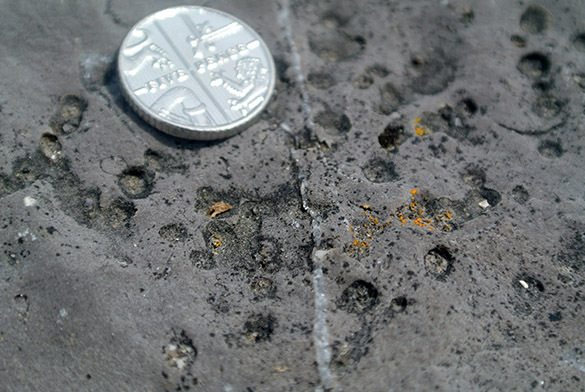 The Carboniferous limestone is punctured by numerous small borings (Trypanites) drilled by filter-feeding worms of some kind when the Early Jurassic sea covered this surface. They are the clusters of small black dots shown above. 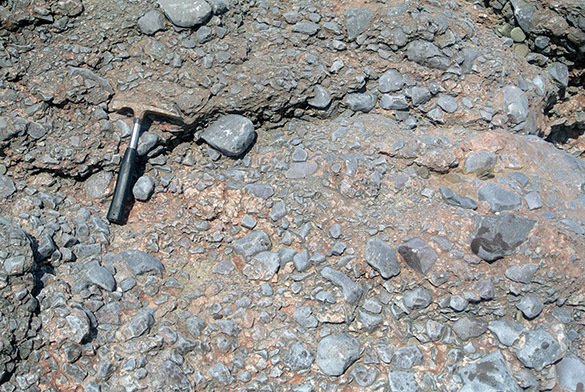 In this closer view of the borings you can see that they are filled with a lighter Jurassic sediment. The openings have been somewhat enlarged by weathering. 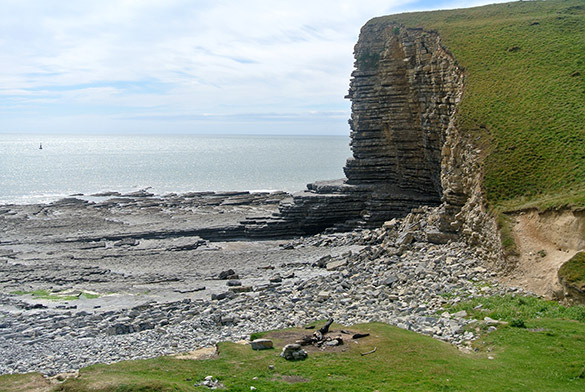 This erosion surface shows some relief, probably formed by cobbles and pebbles washing over it during the Early Jurassic. 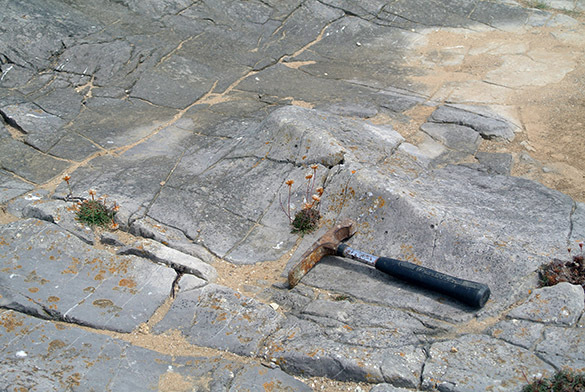 This matches what we see on modern wave-cut rocky platforms. 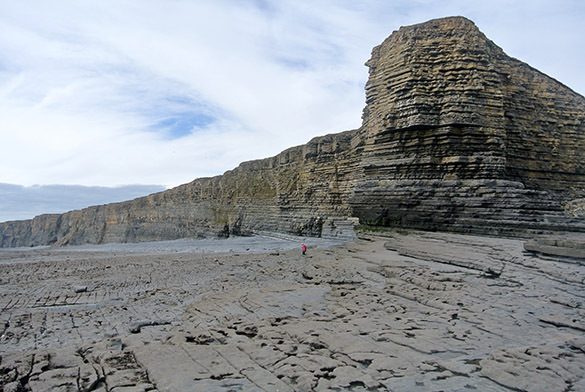 On the same stretch of shoreline there is a small section where Triassic wadi deposits cut down into the Carboniferous limestone — another even more dramatic unconformity, but without marine fossils. Coming from a desert myself, I have an affinity for wadi sediments. They are coarse, angular and poorly sorted. 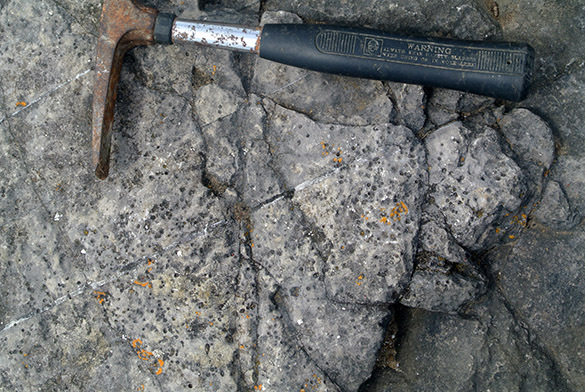 These grains are entirely from the underlying Carboniferous limestone. 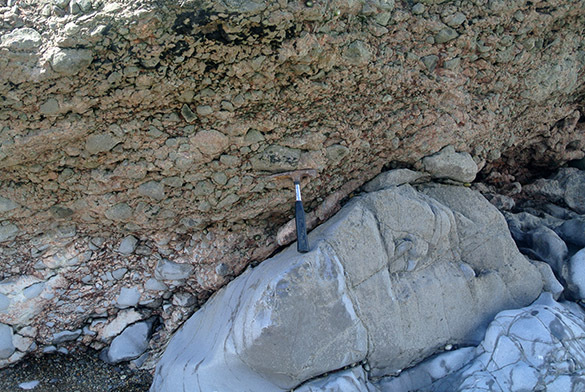 They were likely generated from steep rocky canyons through which intermittent streams flowed. At the end of the day Tim and I visited Nash Point, again on the coast of South Wales. Here the Lias is brilliantly (and dangerously!) 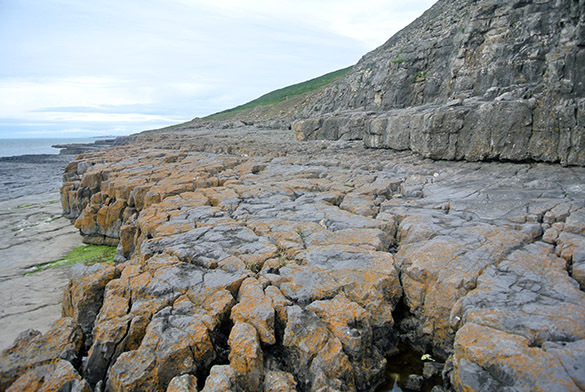 exposed as a series of alternating limestones and shales. We didn’t get too close to these unstable cliffs. 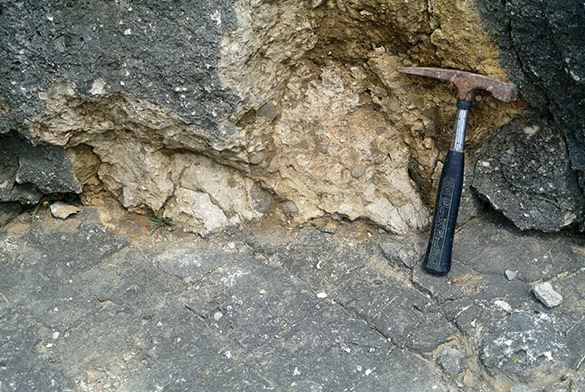 The limestone blocks fall often as the interbedded soft shales holding them in place weather away. We didn’t find much to paleontologically interest us at this last outcrop, but it was beautiful on another stunning coastal day. These cobbles, all made of Lias limestones, are pretty to look at, but tiresome to walk through. We were ready for a slow dinner after this excellent day.